© 2018 Clementsen et al. Distal radial fracture is the most common fracture in humans. The purpose of the present study was to assess the compensation claims filed to The Norwegian System of Patient Injury Compensation (NPE) after the treatment of distal radial fractures from 2000 through June 2013. Data received by the NPE were collected and categorized into groups depending on acceptance or rejection of the claim. In both groups, the cases were systemized according to the type of primary treatment, either operative or conservative. Patient demographics were recorded, along with the patient´s reason(s) for the compensation claim, registered complications and the NPE´s reason(s) for the acceptance or rejection of the claim. Eight hundred compensation claims were received. Forty-three percent of claims were granted, of which 71% had been treated conservatively and 29% had received surgical treatment. Pain was the most common complaint. There were a higher number of upheld claims in hospitals with a population area of less than 100,000 people as opposed to larger hospitals. The most common cause for compensation was delayed intervention when reduction was lost after conservative treatment. Most of the compensations after surgery were due to wrong technique. Only 30 patients with upheld claims received volar plating. Pain is not a valid reason for compensation on its own. There is a higher risk of ending up with a complication that leads to compensation if the patient is treated in a small hospital. Keywords: Distal radial fractures, Compensation, Patient injury, Patient claim, Surgical treatment, NPE. Traditionally, surgical options for distal radial fractures included closed reduction and percutaneous pinning, external fixation or less frequently open reduction and internal fixation. However, a change in management occurred in the late 1990s with the introduction of the volar locking plate which has been shown to yield predictable good results, increasing the number of distal radial fractures treated with open reduction and internal fixation . Complications, however, do occur after both conservative and surgical treatment . The Norwegian System of Patient Injury Compensation (NPE) is a government agency subject to the Norwegian Ministry of Health and Care Services, established in 1988. It includes both the private and public sector, and it is the only institution in Norway that assesses compensation claims after patient injury. The NPE is a “no-blame” system, which is funded by the regional health authorities. All institutions, private and public, pay a compulsory fee to the NPE. Additionally, the hospitals pay a contribution in each liable case. Applying for compensation is free, and the decision can be appealed at no cost to the patient. To qualify for compensation, three conditions must be met. Firstly, the patient must have suffered an injury caused by the treatment, lack of treatment, examination, diagnosis or follow-up. Generally, the treatment or lack of treatment must be deemed erroneous or substandard care. If the complication was a direct result of the primary injury they were being treated for, they are not entitled to compensation. Secondly, the patient injury must have resulted in a substantial financial loss (currently set at 10,000 NOK, 1100 EUR) in addition to any losses that would otherwise incur or have resulted in permanent medical disability of at least 15%. Thirdly, one can only apply for compensation within a reasonable time after the injury, currently set to three years after the patient ought to have understood that it was the treatment received, or the lack of treatment that caused the injury. The NPE rewards compensation based on the patient complaints supplemented by statements from the involved institutions and a neutral expert, thus patient reason for complaint and the NPE´s reason for granting or rejecting compensation do not necessarily correlate. The purpose of the present study was to assess the compensation claims filed to the NPE after the treatment of distal radial fractures. Data from all claims received by the NPE regarding distal radial fractures (International Classification of Diseases ICD-10 diagnosis code S52.5) from 2000 through June 2013 were collected. The data were retrospectively analysed, systemized and sorted into categories at the discretion of the authors. The cases were divided into groups depending on acceptance or rejection of the claim. In both groups, the cases were systemized according to the type of primary treatment, either operative or conservative. The type of any surgery was registered. Patients who underwent delayed procedures were noted. Patient demographics (gender and age at the time of injury) were recorded, along with the patient´s reason(s) for the compensation claim, registered complications and the NPE´s reason(s) for the acceptance or rejection of the claim. Lastly, the hospitals were classified according to the patient volume defined as the catchment area population and grouped according to low, medium or high volume. Descriptive statistics were used to analyse patient demographics. Means and standard deviation were reported for continues variables, and categorical data were reported in frequencies. Groups were compared by independent samples t-test or χ2-test. The Cochran-Armitage test was used for trend analysis. Hospitals were compared by ANOVA after assuring that groups had similar standard deviations (Bartletts´ and Brown-Forsythe test), and p-values adjusted for multiple testing by Tukey’s comparisons test. All tests were two-sided, and results with p-values below 0.05 were considered to be statistically significant. During the study period, the NPE received 42.170 compensation claims, of which 15.246 (36%) were in the field of orthopaedic surgery. Compensation was granted to 6.127 (40%) of the orthopaedic cases. The study group consisted of the 800 received compensation claims after treatment for distal radial fractures, which accounted for 5% of all orthopaedic claims and 2% of the total claims. Three hundred and forty-three (43%) claims were accepted, of which 243 (71%) patients were primarily treated conservatively and 100 (29%) patients were primarily treated operatively. There was no statistically significant difference in the percentage of granted claims in either group (p=0.3). Of 100 patients who received primary surgical treatment, 36 were treated with percutaneous pinning, 30 received an open reduction and internal fixation with plate and screws, and 28 were treated with external fixation. Six patients received other types of primary surgical treatment including three patients with Chauffeur fractures who received screws only. The patiens’t demographics and mode of primary treatment are presented in Table 1. Table 1. Patient demographics and type of primary treatment in 800 complaints after treatment for a distal radial fracture received by the NPE between 2000 and 2013. The number of complaints per year showed a steady decrease in the last part of the study period, from 81 claims in 2003, to 25 claims in 2012 (Fig. 1). However, the mean percentage of granted claims per year (43%; 95% CI: 41-46%) did not show a significant trend (p=0.9). Fig. (1). Number of claims and outcome per year. The most commonly reported injury or complication was pain, reported by 262 (33%) patients. Only 69 (26%) of these patients had their claim upheld (Table 2). Table 2. Patient-reported reasons for complaint and outcome. The NPE´s reasons for granted claims are listed in Table 3, with delayed surgery being the most frequent followed by a wrong surgical technique. Table 3. Reasons for granted claim according to the NPE. 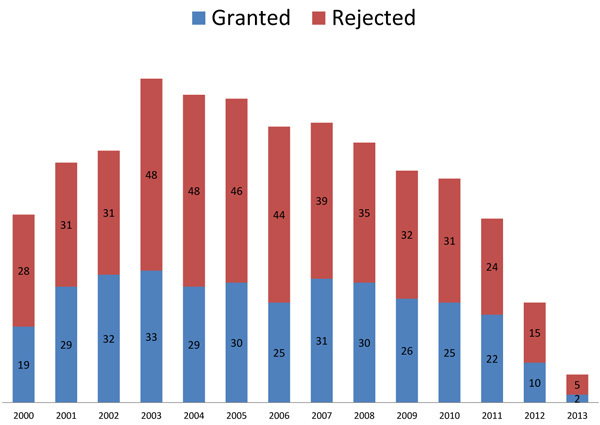 Revision surgery was done in 160 (47%) of the 343 granted compensations. Of these, 103 (64%) patients had been treated conservatively and 57 (36%) had been operated primarily (p=0.01). The most frequent revision surgery was corrective osteotomy carried out in 97 of 160 (61%) patients (Table 4). Twenty-three of the 30 patients who received plate and screws as primary treatment underwent revision surgery, 10 of which were the removal of the implant. The most common reason for implant removal was malposition of the screws causing tendon irritation (2 patients) or tendon rupture (3 patients). There were two cases of deep infection leading to implant removal. Two implants were removed due to loosening, while one patient developed carpal tunnel syndrome, prompting the removal of the plate and release of the carpal tunnel. Table 4. Consequences of patient injury: types of revision surgery. Complex Regional Pain Syndrome (CRPS) was mentioned in 154 complaints and compensation was granted in 54 (35%) of these, of which 52 (96%) were women. Thirty-six of 54 patients had been treated conservatively, five had received external fixation, seven percutaneous pinning and nine patients plate and screws. There was a statistically significant larger fraction of upheld claims in hospitals with a population catchment area of less than 100,000 people compared to the midsize (100.000 to 200.000) and larger (>200.000) hospitals (Fig. 2). There was no statistically significant difference in types of primary treatment between hospitals of different sizes. One in twenty claims to the NPE after orthopaedic surgery was related to the treatment of distal radial fractures. Compensation was granted in approximately four out of ten claims. Seventy-four percent of the complaints came from women; which correlate with the three to four-fold higher incidence of distal radial fractures in women [3, 4]. Interestingly, twice as many claims were registered after primary conservative treatment than after primary surgical treatment, yet there was no statistically significant difference in the percentage of upheld claims. The first nationwide study of compensated patient injury claims following distal radius fractures was recently published by Finnish researchers . The authors studied 584 claims received by the Finnish Patient Insurance Centre, which as the NPE, is a no-fault patient insurance system. In Finland, 36% of claims were granted, which is slightly less than our result of 43%. They found that adverse results fall into three main groups; diagnostic errors (36%), decision/planning errors (18%) and technical errors (32%). The most common cause of diagnostic error was the failure to discover re-displacement, and over half of the adverse events in the non-operative treatment group occurred during early follow-up visits. This is in accordance with our findings, with a majority of compensation granted to patients who received delayed surgery after conservative treatment. These findings remind us that conservative management also carries risk, which might lead to medico-legal consequences. Fig. (2). Number of granted complaints in respect to patient volume. The three categories on the x-axis represent the catchment population of the hospitals. The current study demonstrates that pain does not lead to compensation on its own. Only 27% of patients with pain as the main complaint received compensation. However, malunion is not regarded as acceptable, with a compensation rate of 64%. Most of the claims due to inadequate treatment (76%) also receive compensation. The NPE is making a point of saying that if you have pain, but the fracture has been treated adequately and heals without malunion, the pain is a natural consequence of the fracture and not caused by a failure of treatment; hence compensation is not granted. Pain was also a major complaint in patients who suffered CRPS. 62% of the patients who had their claim granted due to pain had CRPS, and most of these were treated conservatively. It is a curious fact that not all patients with CRPS complained mainly about pain. It is also interesting that 96% of the upheld claims after CRPS were from female patients, which is considerably higher compared to the ratio of male/female complaints. However, CRPS affects women three times more often than men . This, in combination with the high incidence of distal radial fractures in postmenopausal women, may explain the complete dominance of women affected by CRPS in our study. Having CRPS was not in itself a cause for compensation. Only 35% of the complaints concerning CRPS had their claims upheld. If discovered early and treated accordingly, the claim was denied. If it was not discovered early enough or if adequate measures were not taken, the NPE considered this a breach of good clinical practice and granted the claim. Of 100 patients who received surgery, only 30 received Open Reduction and Internal Fixation (ORIF) by plating, mainly volar plates. The total number of claims made to theNPE has increased every year since the start, and increased to 30% from 2010 until 2015 . Between 1993-99, distal radial fractures accounted for 7% of the claims , slightly more than the 5% in our study. In 2005-2007 the Norwegian Orthopaedic Association decided to establish guidelines for treatment of distal radial fractures, based on the high number of cases submitted to the NPE in the previous years . Approximately one third of distal radial fractures in Norway received surgical treatment during 2009 – 2014, with a major shift towards increased use of volar plates at the end of the period . Volar plates accounted for approximately 80% of surgical treatments in Norway in 2013. At the same time, there is a slight increase in the number of patients receiving operative treatment. It is not unreasonable that the introduction of a new successful surgical technique has increased both the general interest in and perhaps the prestige among orthopaedic surgeons for this common orthopaedic injury. With increased attention, the quality of care is also improved. According to our study, it seems that surgical treatment leads to fewer upheld complaints. This was also shown in the array of reasons given by the NPE as to why a claim was granted. The most common causes among conservatively treated patients were delayed surgery and the use of a wrong technique. These were patients that should have been operated primarily, but were not. The decline in claims in the latter half of the study period when the volar plates became more popular may be explained by a better outcome for the patient. It might also reflect that the shift towards surgical treatment has moved the management of distal radialfractures from the emergency department and outpatient clinic to the specialized orthopaedic departments. The surgery is carried out by more experienced doctors, with improved information to the patient. Patients may, therefore, feel that their fracture has been taken proper care of, regardless of the functional outcome. Our study cannot determine whether or not plates yield better clinical results than less invasive procedures. Recently, a large pragmatic randomized controlled trial did not show clinically relevant differences between closed reduction and percutaneous pinning and open reduction and internal fixation . Most of the compensations after surgical procedures were granted due to a wrong technique. Patients who ended up with malunion after percutaneous pinning or external fixation should, according to the expert opinion of the NPE, have received a different surgical treatment. Most of the compensations after volar plating were granted due to technical errors, such as misplacement of the plate and/or screws, inadequate reposition or fixation. Ten patients had their implant removed due to complications such as tendon irritation, implant loosening or deep infection. Plate removal is not recommended routinely following volar plating, as the implant is protected by volar muscles and should not cause symptoms when placed appropriately. It is worth mentioning that only three percent of granted claims were caused by too aggressive surgical treatment. We don’t know if this is due to favourable views regarding surgical management of distal radial fractures by the experts at the NPE or not. In a study of complications and compensation claims after paediatric distal humeral fractures in Finland , the authors found that the size of the hospital mattered in calculating the risk of a complication. Smaller hospitals had higher number of complications than larger hospitals. Similar results’ regarding hospital size has been found after hip fractures, where low-volume hospitals had higher rates of postoperative infection, pneumonia and transfusion  Others have found an increased mortality in hospitals with lower volumes, especially for selected cardiovascular and cancer surgery [13, 14]. In trauma surgery, a correlation between low volume hospitals and increased mortality has been identified, suggesting that regionalizing emergency care will give better results . It has been argued that this increase in complications and mortality might be due to low volume by each caregiver or surgeon, and not by the hospital size itself . However, there was a correlation between these factors in most cases. 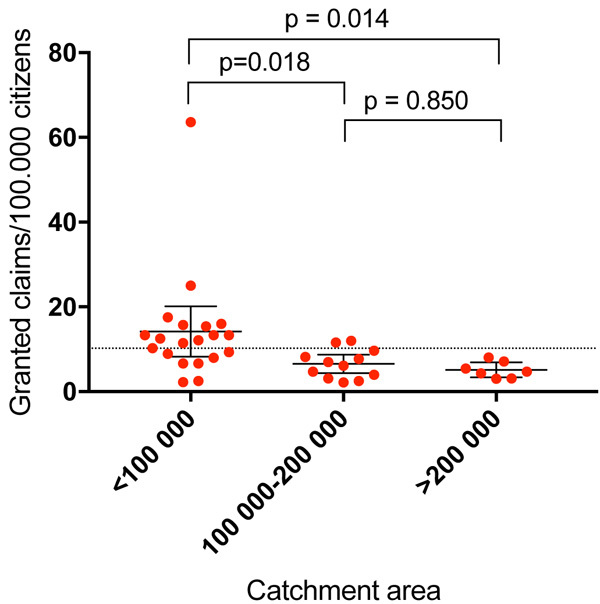 We found a significantly higher rate of upheld claims if the patient was treated in a hospital with a catchment area of less than 100,000 people, compared to larger hospitals (Fig. 2). The data do suggest that the outcome is more predictable at a hospital with a larger patient volume. This study was based on data collected from the NPE only. The compensation schemes differ greatly between European countries. The NPE is a public no-blame system similar to the national schemes in Sweden, Denmark and Finland. In other countries, such as the UK, Germany and Italy, the medical liability is settled in courts in an adversarial system. Therefore, comparison between countries can be difficult, and the consequence for the clinician will be very different between nations. However, even if the legal systems vary, the medical treatment of distal radial fractures is comparable between nations. The main purpose of this article is not to discuss the legal aspects of the NPE, but to present the clinical aspects of the claims. Furthermore, this is not a study on complications after distal radial fractures. Many small and large complications will never be reported to the NPE. The cases were also spread over a large number of years, and will therefore have been investigated by many different experts. These experts may have different views on what was the standard treatment at the time. The most common cause for compensation was delayed intervention when reduction was lost after conservative treatment. This highlights the importance of adequate follow-up logarithms, to identify patients in need for surgery. Most of the compensations after surgery were due to wrong technique. Only 30 patients with upheld claims had received volar plating as primary treatment. Pain is not a valid reason for compensation on its own. There is a higher risk of ending up with a complication that leads to compensation if the patient is treated in a small hospital. OLH: Study design, protocol and data collection, manuscript revision. PHR: Study design, data analysis, writing and revision of manuscript. The protocol was reviewed by the Regional Committee for Medical and Health Research Ethics of Norway (15.10.2010). Granting of consent was deemed unnecessary as the data were collected from anonymous medical records. The reported experiments are in accordance with the standards of the responsible ethic committee and with the Helsinki Declaration of 1975, as revised in 2000 and 2008. Consent for publication was granted by the Norwegian System of Patient Injury Compensation. Mellstrand-Navarro C, Pettersson HJ, Tornqvist H, Ponzer S. The operative treatment of fractures of the distal radius is increasing: Results from a nationwide Swedish study. Bone Joint J 2014; 96-B(7): 963-9. Mathews AL, Chung KC. Management of complications of distal radius fractures. Hand Clin 2015; 31(2): 205-15. Lofthus CM, Frihagen F, Meyer HE, Nordsletten L, Melhuus K, Falch JA. Epidemiology of distal forearm fractures in Oslo, Norway. Osteoporos Int 2008; 19(6): 781-6. Diamantopoulos AP, Rohde G, Johnsrud I, Skoie IM, Hochberg M, Haugeberg G. The epidemiology of low- and high-energy distal radius fracture in middle-aged and elderly men and women in Southern Norway. PLoS One 2012; 7(8): e43367. Sandelin H, Waris E, Hirvensalo E, et al. Patient injury claims involving fractures of the distal radius. Acta Orthop 2018; 89(2): 240-5.
 de Mos M, de Bruijn AG, Huygen FJ, Dieleman JP, Stricker BH, Sturkenboom MC. The incidence of complex regional pain syndrome: A population-based study. Pain 2007; 129(1-2): 12-20. Alfsen GC, Chen Y, Kähler H, Bukholm IR. Pathology-related cases in the Norwegian system of patient injury compensation in the period 2010-2015. Tidsskr Nor Laegeforen 2016; 136(23-24): 1984-7. Bjerkreim I, Steen H. Analysis of 700 orthopedic complaints reported to the Norwegian patient compensation system. Tidsskr Nor Laegeforen 2001; 121(26): 3050-2. Kvernmo HD, Krukhaug Y. Treatment of distal radius fractures. Tidsskr Nor Laegeforen 2013; 133(4): 405-11. Costa ML, Achten J, Parsons NR, et al. Percutaneous fixation with Kirschner wires versus volar locking plate fixation in adults with dorsally displaced fracture of distal radius: Randomised controlled trial. BMJ 2014; 349: g4807. Vallila N, Sommarhem A, Paavola M, Nietosvaara Y. Pediatric distal humeral fractures and complications of treatment in Finland: A review of compensation claims from 1990 through 2010. J Bone Joint Surg Am 2015; 97(6): 494-9. Browne JA, Pietrobon R, Olson SA. Hip fracture outcomes: Does surgeon or hospital volume really matter? J Trauma 2009; 66(3): 809-14. Luft HS, Bunker JP, Enthoven AC. Should operations be regionalized? The empirical relation between surgical volume and mortality. N Engl J Med 1979; 301(25): 1364-9. Birkmeyer JD, Siewers AE, Finlayson EV, et al. Hospital volume and surgical mortality in the United States. N Engl J Med 2002; 346(15): 1128-37. Ogola GO, Haider A, Shafi S. Hospitals with higher volumes of emergency general surgery patients achieve lower mortality rates: A case for establishing designated centers for emergency general surgery. J Trauma Acute Care Surg 2017; 82(3): 497-504. Birkmeyer JD, Stukel TA, Siewers AE, Goodney PP, Wennberg DE, Lucas FL. Surgeon volume and operative mortality in the United States. N Engl J Med 2003; 349(22): 2117-27.